Jenny was the creation of cartoonist Russell Keaton, who was just coming off a stint on Skyroads, another early aviation comic. There, he'd originally worked alongside Zack Mosely, who left in 1933 to do Smilin' Jack. Keaton followed in Mosely's footsteps in October, 1939, when he created Flyin' Jenny. The strip's distributor was Bell Syndicate, which also handled Mutt & Jeff, Don Winslow and the political cartoons of Rube Goldberg. Right from the start, it came out both daily and Sunday, with each running a separate storyline. Keaton's original plan was to call the character Virginia Dare, the first name being that of his wife and the last chosen to suggest daring action and adventure. But Virginia Keaton pointed out the two came together as the name of the first English child born in what is now the United States. 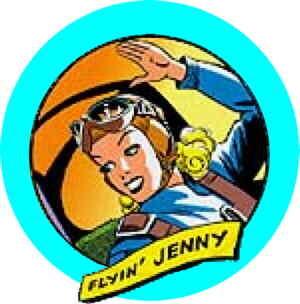 The cartoonist decided on Jenny, a possible nickname for Virginia, for his protagonist's first name. The strip itself then became Flyin' Jenny. The title was a familiar phrase at the time, as the name of an aircraft model that dated back about 20 years. Earlier, it had been used for a mule-powered carousel, "jenny" being the word for a female of that species. Jenny's character was established early on, as she got herself a test pilot job at Starcraft Aviation Factory by putting on an unexpected demonstration of spectacular aerial expertise in front of company bigwigs. The excitement didn't stop, as she quickly found herself involved with spies, saboteurs, criminal masterminds, and all the other sorts of people adventure heroes regularly deal with. A couple of years after the strip started, the U.S. got involved in World War II, and so did Jenny. Keaton started doing all the writing and artwork himself, but soon took on help. The most notable were writer Glenn Chaffin (co-creator of the pioneering aviation strip Tailspin Tommy) and artist Marc Swayze (Mary Marvel). During the war, it was sometimes ghosted by Gladys Parker (Mopsy). It was Chaffin and Swayze who took over when, on February 13, 1945, Keaton died at the tragically young age of 35. That's also about when Jenny started running into trouble, in both the strip and the outside world. In the strip, she found it as hard to adapt her wartime skills to the postwar world as many other veterans — that is, there weren't as many jobs available to aviators as there were military-trained aviators to fill them, making it difficult for her to earn a living. And her problems in the outside world were similar. It may have been discouragement and lack of direction following Keaton's death, but whatever the reason, she didn't make the transition to postwar-style aviation adventuring of the kind seen in Steve Canyon and Buz Sawyer. Her strip ended during July of 1946. There was a brief sputter of life a few months later, when a tiny comic book publisher reprinted her stories for two issues, but Jenny had passed into history. Text ©2005-07 Donald D. Markstein. Art © Bell Syndicate.